Eurocare are leading UK specialists when it comes to the disposal of clinical waste. 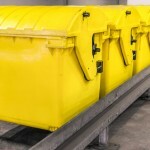 UK legislation imposes strict controls and regulations on all organisations to make sure that clinical waste is disposed of in a safe, environmentally-friendly manner. There is also a strict duty of care that needs to be adhered to so that you can be compliant. Eurocare can help you with all the legal requirements and make sure that your organisation is fully compliant with all the responsibilities. Eurocare Clinical waste services offer a tailor made service package to safely remove waste of this type from your premises. Sanitary waste or other wastes that have been assessed as non-infectious. 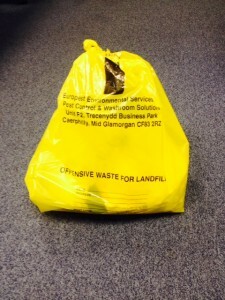 The waste is disposed of in our high quality yellow bags with a black ‘Tiger’ stripe. These are collected on a regular basis to suit your needs. This type of waste is classed as non-infectious, offensive / hygiene waste and is disposed of at licensed waste disposal facilities following collection from your site. Eurocare are fully compliant with the Department of Health Guidance on the Safe Management of Healthcare waste.